"Riften Docks" redirects here. For information on the docks, see Riften. Shadowfoot Sanctum is a small player home located in the Ratway beneath Riften. The map marker for the exterior entrance is called Riften Docks. You will be directed to buy the house from Vekel the Man for 7,500 gold during the related quest. The house consists of one area, Shadowfoot Sanctum. This house possesses two entrances, allowing for easy access to the Thieves Guild without having to enter Riften itself. The main entrance is located behind a gate in the Ratway, in the room with the executioner's block just across from The Ragged Flagon. The second, hidden entrance is an underwater trap door located in the murky pool in the forge area of the sanctum, which leads to a flowing sewer grate outside the walls of Riften. 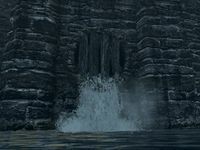 This entrance can be found in the water just south of the western city gates. This Creation adds a new map marker for the Riften Docks which allows for easy access to Shadowfoot Sanctum, as it will place you on the bridge leading to the Riften Warehouse, conveniently overlooking the sewer grate. Entering from the Ratway, you will find yourself in a narrow sewer passage with running water and the skeletal remains of some poor unfortunate trapped behind a sewer grate. This skeleton possesses some minor treasure. Following this passage, you will come to an open area containing a workbench, a small smelter, a grindstone, an anvil, and a tanning rack. This room also possesses a banner with a Guild Shadowmark as well as a murky pool with a hidden trapdoor leading to Riften Docks. 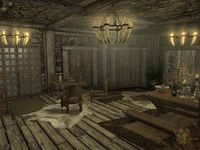 The next room serves as a well-lit dining area and reading room resembling a typical Riften basement. It contains a shrine of Akatosh and a unique painting. Within one of the wardrobes you will find a false back panel leading to a trophy room with sixteen mannequins, a chest surrounded by piles of gold, a well-stocked alchemy lab, an arcane enchanter, and weapon racks. One of the shield plaques displays a (likely ill-gotten) Riften Guard's Shield. This room also contains holders for all ten dragon claws from the base game, the five bugs in a jar, the Right Eye of the Falmer, the Spider Control Rod (the one for Aicantar's Spider, not the one from Forgotten Seasons), the five paragons from the Forgotten Vale, Chillrend, Grimsever, the Nightingale Bow and Nightingale Blade, as well as all of the dragon priest masks in the base game and Dragonborn, with the exception of Miraak. In addition, there are shelves for all of the items collected for The Litany of Larceny. However, these will not activate until after the item has been turned in, so the items will need to be removed from the Thieves Guild afterwards and moved here instead. Returning to the main dining room, you will find three side rooms behind closed doors. One of these leads to a kitchen, which contains an oven and a cooking pot. Two Glass Jars, items unique to this Creation, can be found on a top shelf in here. Another side room contains two child-sized beds and a target dummy for your adopted children. Of note in this room is another Glass Jar found on one of the shelves next to some sweet rolls, along with a shrine of Kynareth on the shelf above. The final side room is the master bedroom, containing a double bed with a shrine of Mara on the shelf above it, next to a Jeweled Goblet and Jeweled Pitcher. Mannequin heights can change at random, either sinking into their bases or floating above them. ? Chillrend does not mount onto named rack correctly, sticks out of rack, or out of mannequin to right side of rack. ?